—Robert F. Drinan, S.J., author of Can God and Caesar Coexist? It has become known to many as the moment when the U.S. Supreme Court kicked God out of the public schools, supposedly paving the way for a decline in educational quality and a dramatic rise in delinquency and immorality. The 6-to-1 decision in Engel v. Vitale (1962) not only sparked outrage among a great many religious Americans, it also rallied those who cried out against what they perceived as a dangerously activist Court. 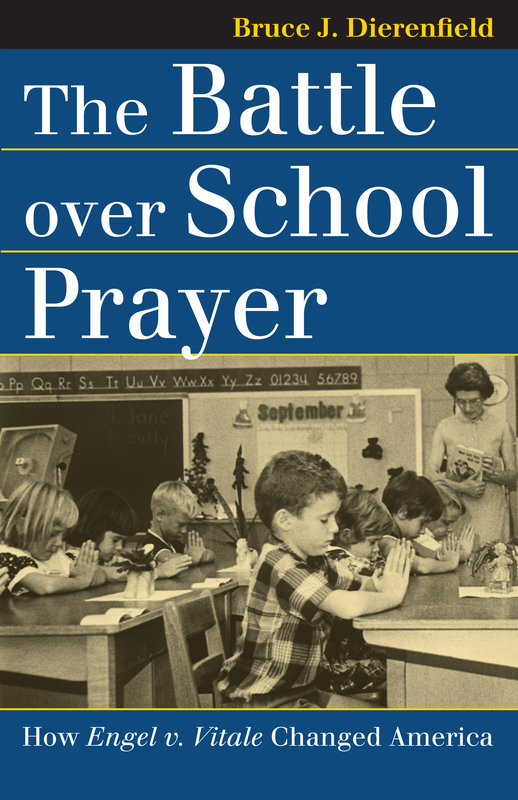 Bruce Dierenfield has written a concise and readable guide to the first—and still most important—case that addressed the constitutionality of prayer in public schools. The 22-word recitation in a Long Island school that was challenged in Engel v. Vitale was hardly denominational—not even overtly Christian—but a handful of parents saw it as a violation of the First Amendment's proscription again the establishment of religion. The case forced the Supreme Court to take a stand on Jefferson's "wall of separation" between church and state. When it did so, the Court declared that by endorsing the prayer recitation—no matter how brief, non-denominational, or voluntary—the Long Island school board had unconstitutionally approved the establishment of religion in school. Writing with impeccable fairness and sensitivity, Dierenfield sets his account of the Engel decision in the larger historical and political context, citing battles over a wide range of religious activities in public schools throughout American history. He takes readers behind the scenes at school board meetings and Court deliberations to show real people wrestling with deeply personal issues. Through interviews with many of the participants, he also reveals the large price paid by the plaintiffs and their children, who were frequently harassed both during and after the trial. For a long time, opponents of the decision have loudly claimed that it was based on a distorted reading of the First Amendment and deprived Americans of their right to practice religion. Dierenfield shows that the polarizing effect of Engel—a decision every bit as controversial as Roe v. Wade—has reverberated through the subsequent decades and gained intensity with the rise of the religious right. His book helps readers understand why, even in the face of this landmark decision, Americans remain divided on how divided church and state should be. Bruce J. Dierenfield is professor of history at Canisius College and author of The Civil Rights Movement and Defending the Wall: The Minnesota Civil Liberties Union and the War against Religious Establishment.